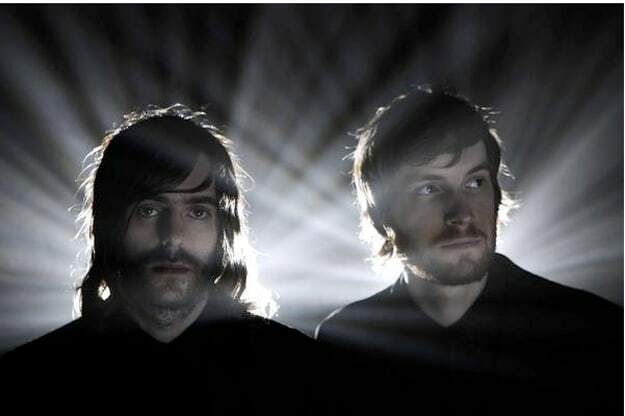 Ratatat is Mike Stroud (left) and Evan Mast. Last week, Complex cover star Kid Cudi moved an impressive 104K units of his debut album Man on The Moon: The End of Day—but more than just sales, Cudi&apos;s record has been generating a lot of discussion with its unique sound. While most people are familiar with Scott Mescudi (click here for our in-depth cover interview if not), those who&apos;ve listened to the album have been asking about Ratatat, who produced two records for the album, including the standout third single "Pursuit Of Happiness (Nightmare)". Complex: When did you first link up with Cudi? Evan Mast: Recently—just a couple months ago. He had been in touch with our A&R guy, but we never had any direct contact with him. We hadn&apos;t heard much of his music or anything, even after "Day &apos;N&apos; Nite" was blowing up. The A&R said he was interested in us doing some production. Then basically Cudi called up one day, and said he&apos;s been following us for a while, and he was into our stuff and interested in a collaboration. Then we started researching his stuff and listening to his mixtapes, and we really liked his stuff. Complex: How did "Pursuit Of Happiness" come about? Evan Mast: We had plans to meet up, but we&apos;d been on tour for a really long time and hadn&apos;t had time to work on new material, and I went to my apartment to listen to beats, I sort of realized I didn&apos;t have much to play him. I spoke to him on the phone and gave him directions, and like in the 15 minutes of him getting in the car and showing up to my place, I put together the piano part and the melody, and then an early version of the drums of the "Pursuit" beat. It was like super last-minute. Complex: So 15 minutes is all it took to put the groundwork of the song together? Evan Mast: Pretty much, the chords and stuff. I ended up going back into the production and tweaking things—but yeah, the melody, the chorus, and the basic beat pattern was in 15 minutes. Complex: Was there a time when you, Cudi, and MGMT were in the same room? Evan Mast: No, we never actually all got together. We had done like a finished version of the track before he got together with MGMT. I think he got with those guys and played them a bunch of tracks off the record, and they were leaning towards that one. He had them do the chorus. Complex: Have you guys worked with MGMT at all? Evan Mast: No, we haven&apos;t met those guys. We&apos;re all supposed to shoot the video for "Pursuit Of Happiness" the day after tomorrow, or something. Complex: Now for "Alive," did that song come after "Pursuit"? Evan Mast: Yeah, that was super last-minute too. We were about to go on tour again, and the day before we left town, it was the last week Cudi was in the studio working on his record, so we went in and kind of did it on the spot. The drums for that beat were actually from a couple years ago, and they were still on my laptop. I always wanted to do something with them. We put the beat together real quick, and came up with some vocal ideas. When we left it was kind of half-done, and then we went back and forth between emails before coming up with the final song. Complex: The album is getting solid reviews, and "Pursuit" is definitely one of the standout tracks. Have you noticed yourselves becoming more popular since the release of Cudi&apos;s album? Evan Mast: We&apos;ve had a bunch of friends say they like the track. We haven&apos;t got a whole lot amount of direct feedback from it. We did the Letterman show a couple of weeks ago. It was fun, we&apos;re like an instrumental band so we usually don&apos;t play those late night shows and stuff. I was pretty nervous going into it, but it turned out to be really fun. Complex: How do you feel about Cudi&apos;s album on the whole? Evan Mast: I think it&apos;s a very interesting record. It&apos;s pretty different from his mixtapes. It&apos;s a very brave record for a debut album—it&apos;s a lot bolder and that&apos;s definitely commendable. Complex: What&apos;s next for you guys? Evan Mast: We have another record that we don&apos;t have a date for yet. It&apos;s mostly done, we&apos;re working on different video ideas for it and working with different directors for it. Might take some time off, because we&apos;ve been touring for ages, and we just got done in August. So now we&apos;ll start working on another project soon. Complex: Do you have plans to work with Cudi again? Evan Mast: Yeah, definitely we&apos;ve been talking about doing other collaborations, I&apos;m not sure if it&apos;s for another project entirely. He&apos;s super-easy to work with. We gelled really well together. His whole process with melodies is similar to the way we work in a way. Once we get the basic style of the track, we get the chorus. He would just start coming up with melodies and then try another idea, another idea, and then choose the best one. He&apos;s real easygoing, it&apos;s a good way of working.